Perhaps this is the right place to add something about the Apple logo. 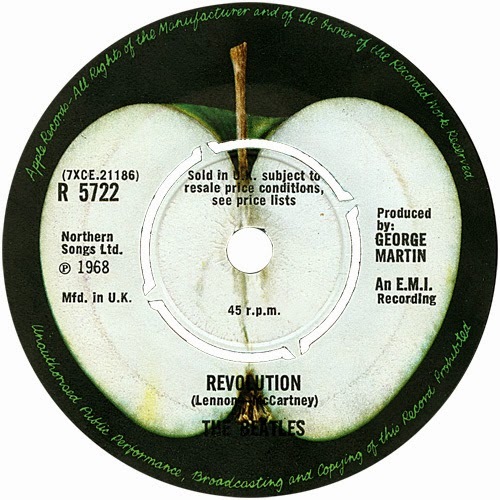 Apple Records of course was The Beatles own record company, launched in the summer of 1968. 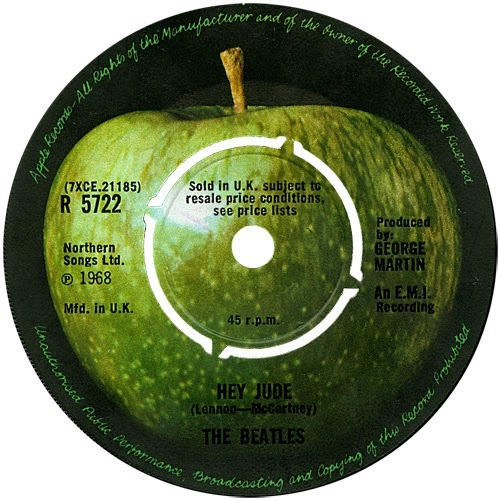 It was first used on the single ‘Hey Jude’/’Revolution’. In 1993 Paul McCartney explained to the Belgian journalist Johan Ral the origins of the Apple idea. “….I had this friend called Robert Fraser, who was a gallery owner in London. We used to hang out a lot. And I told him I really loved Magritte. We were discovering Magritte in the sixties, just through magazines and things. And we just loved his sense of humour. And when we heard that he was a very ordinary bloke who used to paint from nine to one o’clock, and with his bowler hat, it became even more intriguing. Martha and Paul, the painting's on the wall. The name of the painting is actually ‘Le jeu de mourre’ (The Game of Mora). In René Magritte - Catalogue Raisonné (edited by David Sylvester. Menil Foundation/Fonds Mercator, 1993), it is listed as number 1051 and situated late in the artist’s life, in 1966. As Paul still has the original painting only a black and white photograph is available to the public. That title was given by a friend of Magritte’s, the Belgian poet Louis Scutenaire. 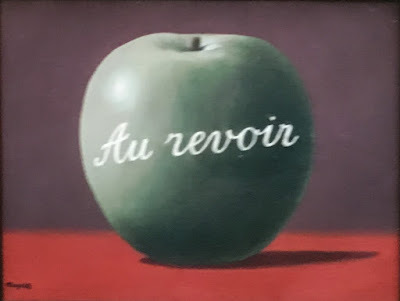 It probably is a pun on ‘Les jeunes amours’ (The Young Lovers), another work by Magritte depicting three apples. The Game of Mora is an existing game. In the catalogue mentioned above, the Larousse dictionary definition of Mora, or Mourre is quoted as "a game in which one of the players rapidly displays a hand with some fingers raised, the others folded inwards, while his opponent calls out a number, which, for him to win, has to correspond to the total of the raised fingers". A colour photo of the painting was published here on the Daily Beatle in March 2014. 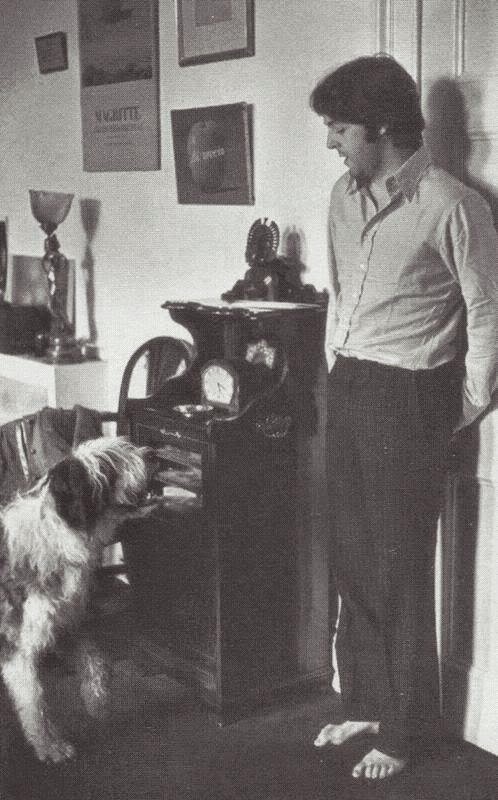 Paul must clearly be mistaken about how, or at least when the painting came into his possession, because the painting is already present in a photo from April 1967 taken at Paul's home in Cavendish Avenue. In Paul’s mind the green apple came to stand for a notion of creative freedom and independence from commercial interests. 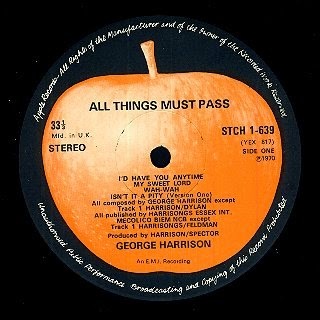 So, Gene Mahon was commissioned to design the Apple record labels, with this painting as inspiration. 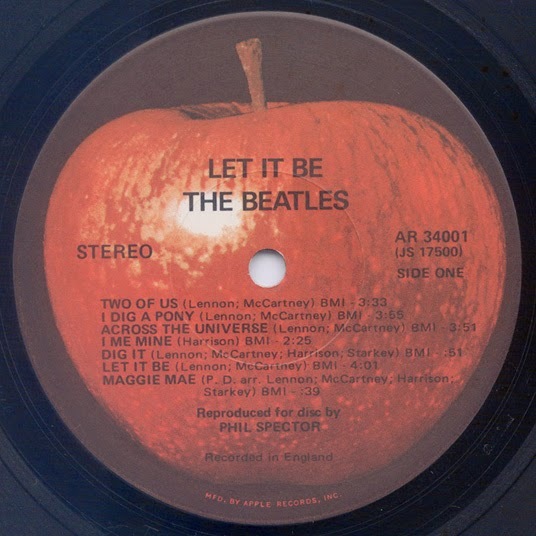 The red Granny Smith apple was used in 1970 for the US issue of the Let It Be album. 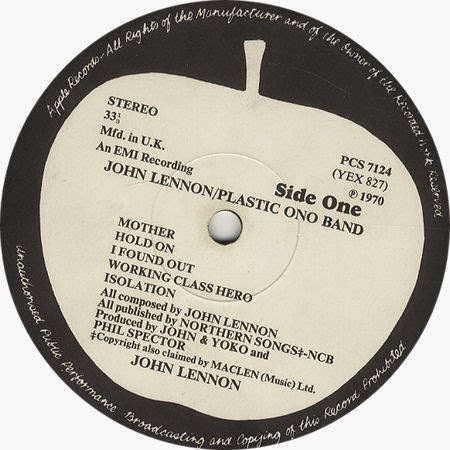 As that album, for contractual reasons, was being manufactured and distributed in North America by United Artists Records, the red apple may have been used to mark the difference - or there may have been no philosophy behind this decision. 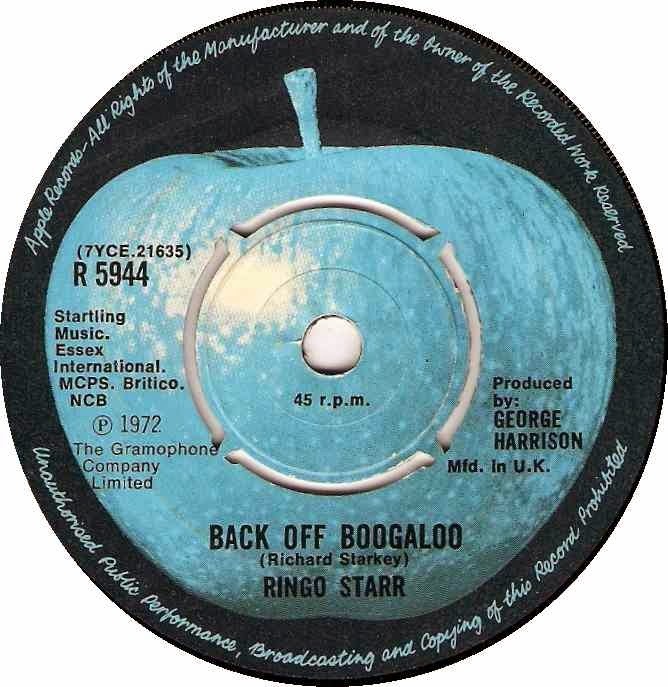 In the seventies, the ex-Beatles felt a little playful with their Apple releases. 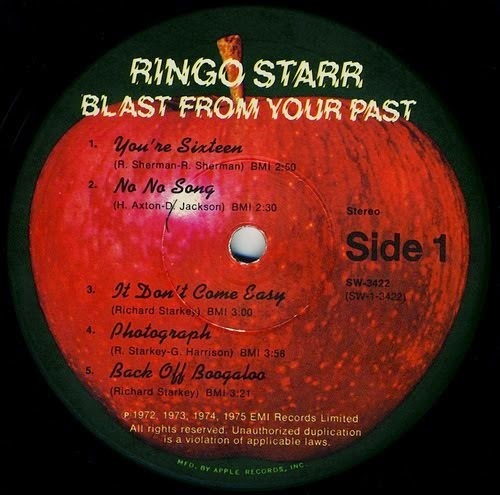 Maybe Ringo should have used the blue apple for his "Beaucoups of Blues" single instead? 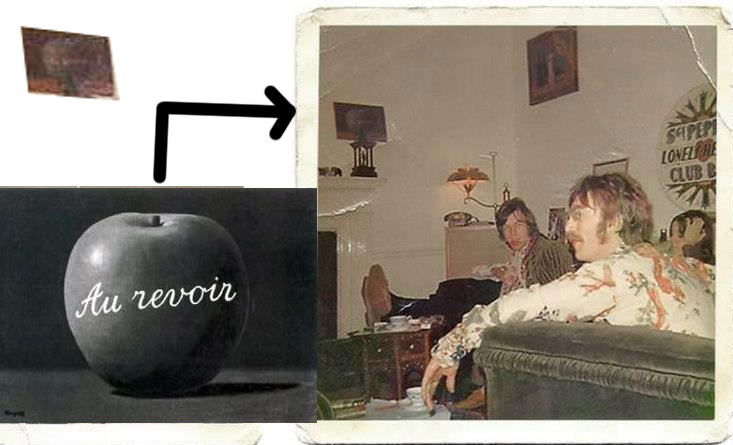 Don't forget that both John and Yoko used a (different) white apple with their faces superimposed.